After global protests against Bank of China funding the controversial hydropower dam in Batang Toru, they respond to the concerns expressed by environmental organisations and the global community. Let’s keep the pressure up! 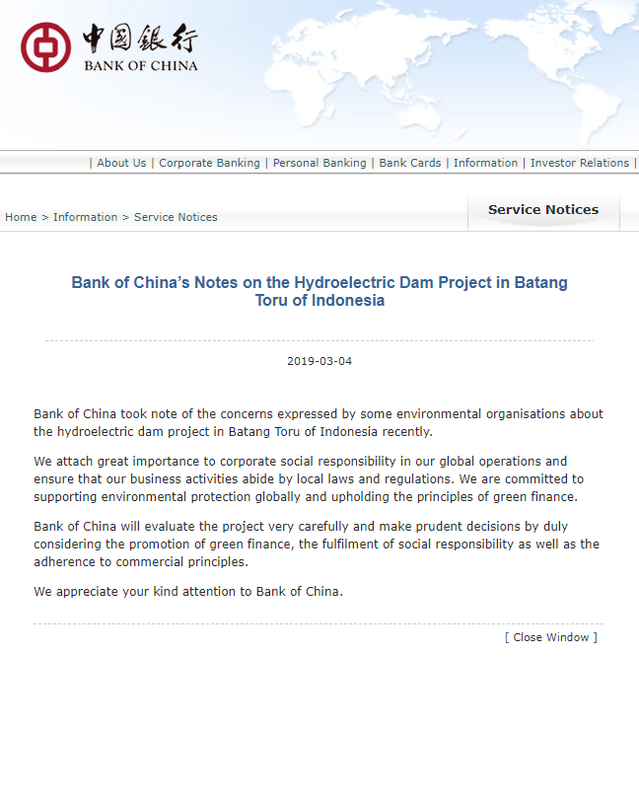 Bank of China took note of the concerns expressed by some environmental organisations about the hydroelectric dam project in Batang Toru of Indonesia recently. We attach great importance to corporate social responsibility in our global operations and ensure that our business activities abide by local laws and regulations. We are committed to supporting environmental protection globally and upholding the principles of green finance. Bank of China will evaluate the project very carefully and make prudent decisions by duly considering the promotion of green finance, the fulfilment of social responsibility as well as the adherence to commercial principles. We appreciate your kind attention to Bank of China.